Amber Glenn practices at the Dr Pepper StarCenter at Craig Ranch. When the first members of the U.S. Figure Skating team begin their quest for gold today in Sochi, one of the best skaters in the country will be far from Russia. Amber Glenn, the 2014 U.S. junior national champion, will instead be watching from her home in Plano. Glenn, 14, is too young to represent her country in Sochi, but that won’t stop her from being there in spirit while preparing for the 2018 games in Pyeongchang, South Korea. Glenn’s first experience on ice skates was similar to that of a lot of Texans. When she was 5 years old she accompanied her cousins to the ice rink at Stonebriar Centre. The trip to the mall was the turning point in the young skater’s life, as she caught the eye of figure skating coach Ann Brumbaugh. Glenn proved to be a quick study under Brumbaugh’s tutelage, taking what she learned in private lessons and racking up high finishes at local and regional competitions. Glenn broke onto the national scene in 2012 when she finished second in the novice division at the U.S. Championships. After moving up to juniors, Glenn finished fifth in 2013 before winning gold last month in Boston at the 2014 U.S. Championships. While Glenn spends hundreds of hours with Brumbaugh and coach Ben Shroats memorizing and perfecting each routine, when it is time to perform in front of the judges, she turns off her brain and lets her body take over. The results don’t come without sacrifice for the Glenn family. To pay for her travel and training, Amber’s father, a Plano police officer, works about 30 hours of overtime per week in side jobs, while her mother stays home to ensure Amber gets to where she needs to be for training. Her devotion to skating also means Amber is not able to have what most would consider a normal childhood. While Amber spends almost every waking hour training or doing school work, she said she would not change a thing. Amber spends about five hours a day on the ice rink, but that is only half of her training regimen. She also practices yoga and Pilates three times a week, trains at the Michael Johnson Performance Center twice a week, and finds time to visit with her sports psychologist and mental toughness coach as needed. With about four hours a day dedicated to school work, Amber said, jokingly, that all she does is train, study and sleep. 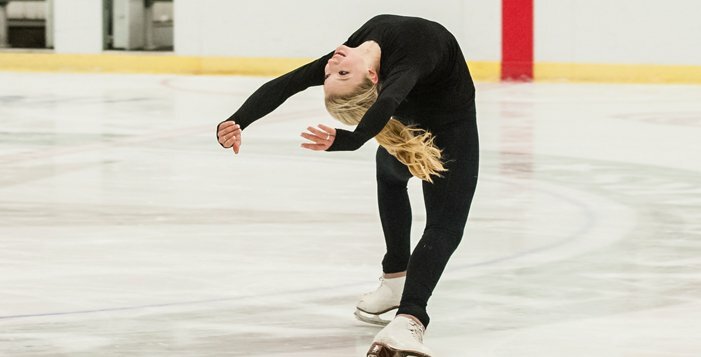 The first step toward making the 2018 Olympic team occurs next month when Amber will skate for the U.S. at the World Junior Figure Skating Championships in Sofia, Bulgaria. After that, Amber and her coaches will continue polishing her skills to ensure she is in a strong position to represent her country in Pyeongchang. For local news coverage, follow Bill Conrad on Twitter.